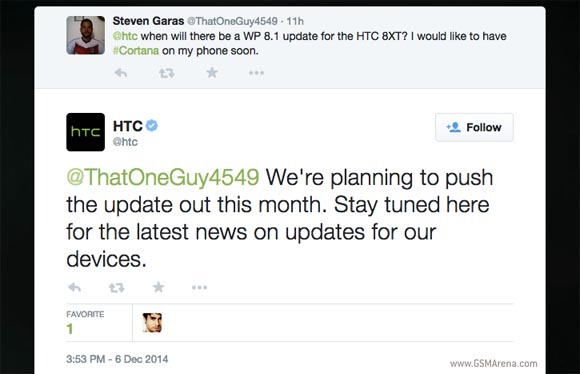 The Sprint-exlusive HTC 8XT is still on Windows Phone 8 and awaiting the expected update to Windows Phone 8.1. Good news for the owners of the handset - HTC has confirmed on Twitter that the device is en route to receive the update by end of the month (and the year, as it is). The update will bring much improvements to the midrange HTC smartphone - folder support, backgrounds on the start screen, the personal voice assistant Cortana, VPN, action and notification centers and more. The HTC 8XT is highlighted by a 4.3" WVGA (480 x 800px) screen, 8MP camera, Snapdragon 400 chipset and a punchy violet exterior. I have heared the update for my device will be out sometime early december and then on sprint form a customer found a release date on their site for 12/11/14. but as everyone through sprint knows that the release date could be wrong.